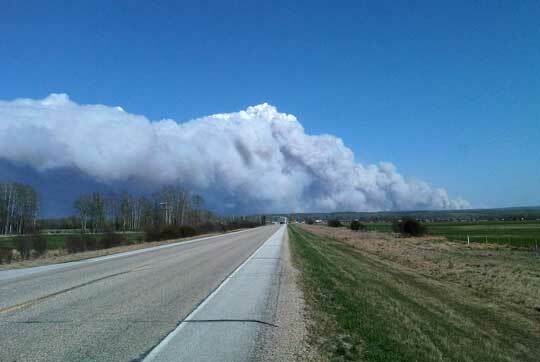 We passed through one fire area just before 4:00 PM on Sunday, May 15th, and approached the final junction before Slave Lake. 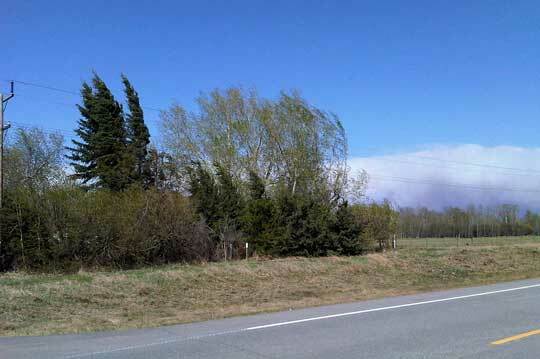 One of the pictures shows the traffic evacuating south to Swan Hills and another shows the wind bending the trees. 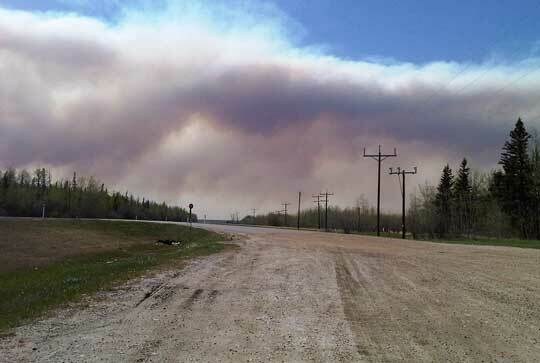 It was difficult to leave the van with the wind against the doors, it was at this point that the reality of the dangerous situation really sunk in, we had smoke all around us at one point while heading south toward Swan Hills (away from Slave Lake). The authorities had stopped letting anyone through and the evacuation was in full progress by then. The first report of fire I had when planning this travel was upon calling Judy at the Visitor Information Centre on her cell, I was giving her a one hour heads up from Donnelly. She told me ten houses had burned at this time and she was not sure I would get into town. I have not heard back from her and figured my business had become pretty peripheral at this juncture, I was so determined to get this delivery done and only truly understood the danger when I joined the line of traffic headed south and saw the other smoke concentrations. Truly, we were surrounded by fires, did not see any flames, the smoke clouds on a clear sky definitely demanded respect for the power of nature that can be found at any given time. Just realizing much later that when we left Fox Creek and I started to see what looked like a smog cloud travelling parallel with me headed north also was actually smoke from a fire that started as I watched it rise in the air, I thought it was a dust storm in the heavy winds… I went on up to Valleyview and did see a fire crew pull into the rest stop, however – did not realize what they were doing around there and no-one I spoke to mentioned a word about it other than a short conversation where the crew chief stated matter of factly to the attendant that they would park there for a bit just in case! So I continued along on my merry way and drove right into a circle of fires – no harm to me personally, I sure am feeling compassion for those that had to flee and was very close to tears when watching people check into the hotels with their one suitcase and such like that. We ended up in Westlock for dinner and a lot of Slave Lake residents were there, not much else to do but get a good meal and hit the road again. One of the hotel groups from my home town of Jasper has businesses up in Slave Lake and they are organizing relief fund raising to help their neighbours, as I have seen them do before. As it happens the Sawridge Inn in Jasper was the facility that took in many of the residents of the apartment I reside in when we had a fire here a few years ago. Great neighbours make difficult events like this more bearable, so look them up on and know they will welcome you.